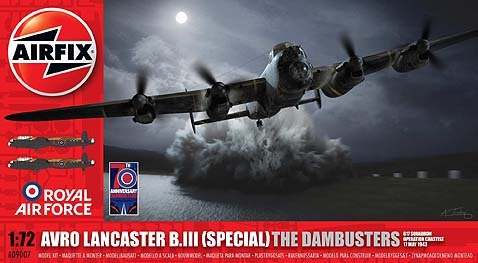 While the Lancaster saw the vast majority of its service as a high altitude night bomber, attacking strategic targets deep within Germany, notably its involvement in the battles of the Ruhr, Hamburg and Berlin, it was a daring low level raid that gave the Lancaster arguably its finest hour. The Dam Busters raid, as it has since become know, was one of the most famous operations of the war. Led by Wing Commander Guy Gibson, the 19 specially modified Lancaster bombers attacked the Mohne, Eder, Sorpe, and Ennepe dams, with the Mohne and Eder dams being breached. This caused widespread destruction to both the German war effort and food production. The dams were breached using a special type of bomb, the Upkeep mine, or 'bouncing bomb'. This was rotated before being dropped so that it skipped along the surface before impacting against the dam, sinking and exploding, thus rupturing the dam. This avoided the need for a high altitude raid and avoided the torpedo nets. The attack was a partial success, but greatly improved the morale of the Allies and the British public.